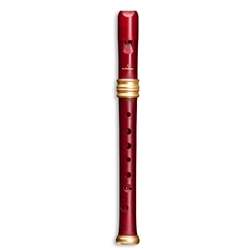 An inexpensive version of the popular 'Dream' soprano designed by Dutch recorder maker Adriana Breukink, these instruments offer a warm, sweet sound in a Renaissance-style instrument, with a wide bore and wide finger holes and lots of volume. Perfect for van Eyck! PLEASE NOTE: These recorders are now available only with double holes in sparkly RED plastic, not black as in some of the photos above. We apologise for the inconvenience.